Interrupting my series on astery things and butterflies for a quick update on the Potomac Gorge, where I went this past Tuesday. After all the flooding, many plants are coming back. They aren’t as tall as they normally would be at this time of year, and some of them are just starting to bloom or bud up, a month or two late. 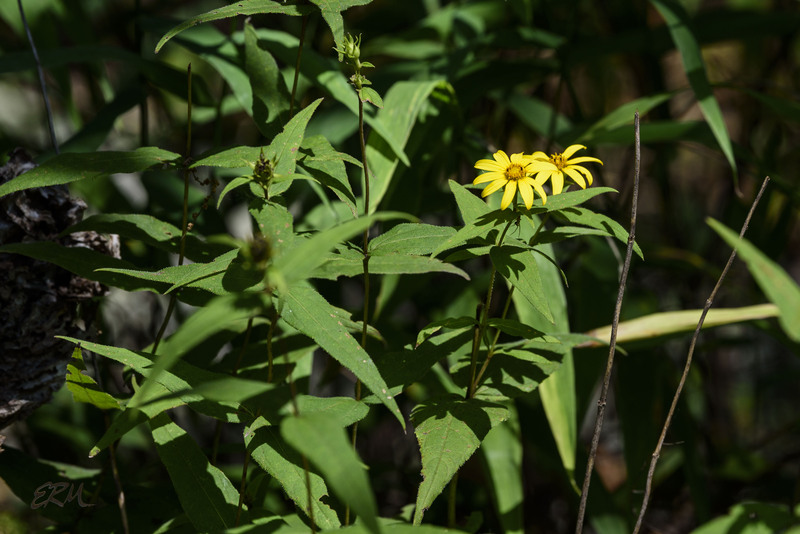 On the riverbanks, large-flowered leafcup (Smallanthus uvedalia) and cut-leaved coneflower (Rudbeckia laciniata) are blooming. A few New York ironweed (Vernonia noveboracensis) are also growing, looking short but with lots of buds. 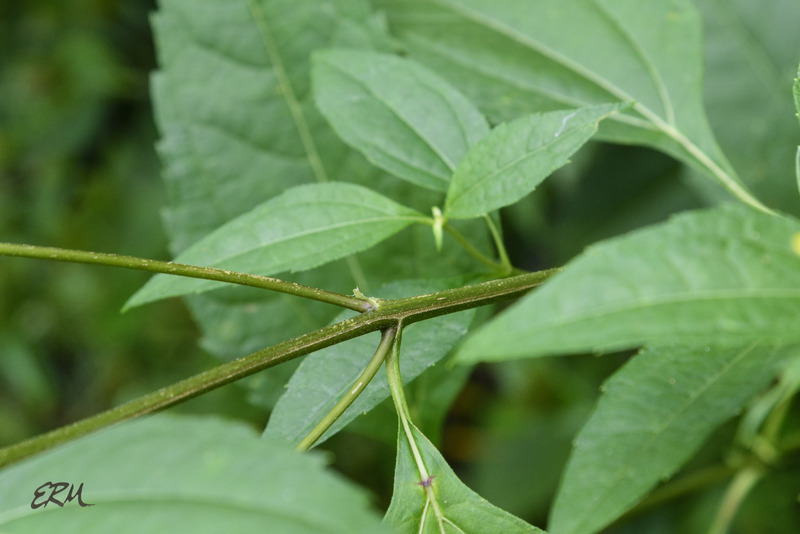 Right by the water’s edge, a few halberd-leaved rosemallow (Hibiscus laevis) are up, at about one-third of their mature height. I found one just starting to form buds; in other years, these plants started blooming in mid July. 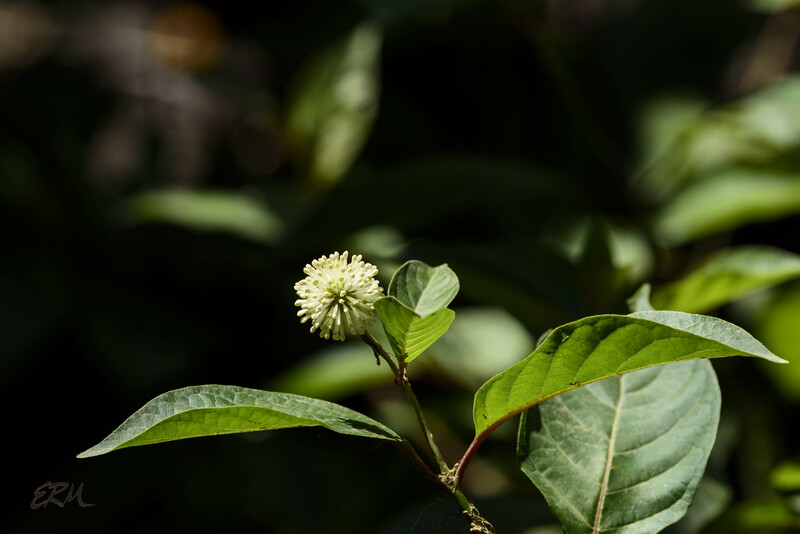 In one place I saw an exceptionally short and shrubby-looking buttonbush (Cephalanthus occidentalis) with a few flower heads just formed, one with buds that will open any day now. In this area they usually start blooming in late June or early July. Inland where there wasn’t any flooding, some of the typical mid-to-late summer bloomers are starting: two species of thoroughworts (Eupatorium) and goldenrods (Solidago) with buds just about to burst. 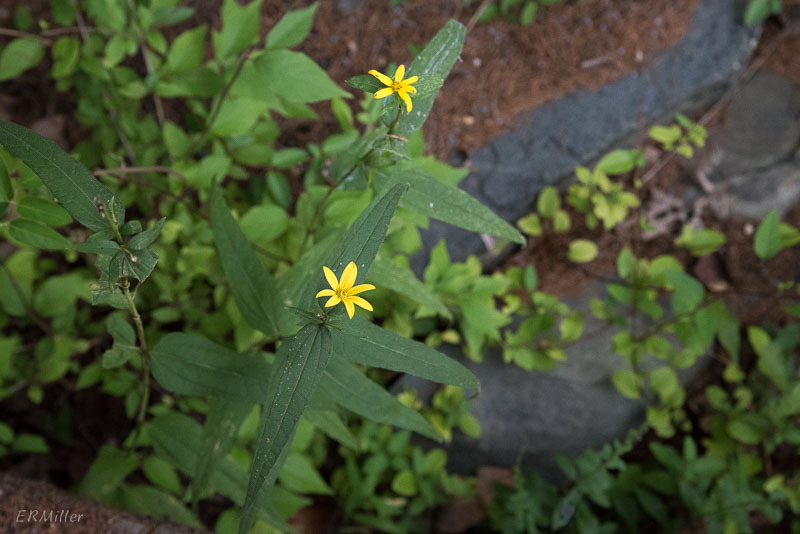 Starry campion (Silene stellata) and woodland sunflower (Helianthus divaricatus) are in full bloom. There were just a few blooms left on a stand of St. Andrew’s cross (Hypericum hypericoides). 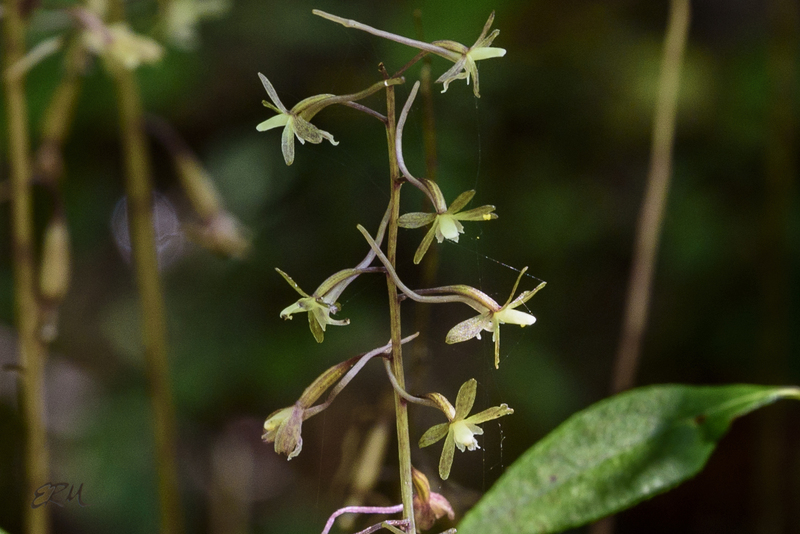 And much to my delight, cranefly orchid (Tipularia discolor) is out. No, Really, It’s Still June: Knock it Off! What is going on with the asters and sunflowers this year? It’s really too early for them to be blooming. 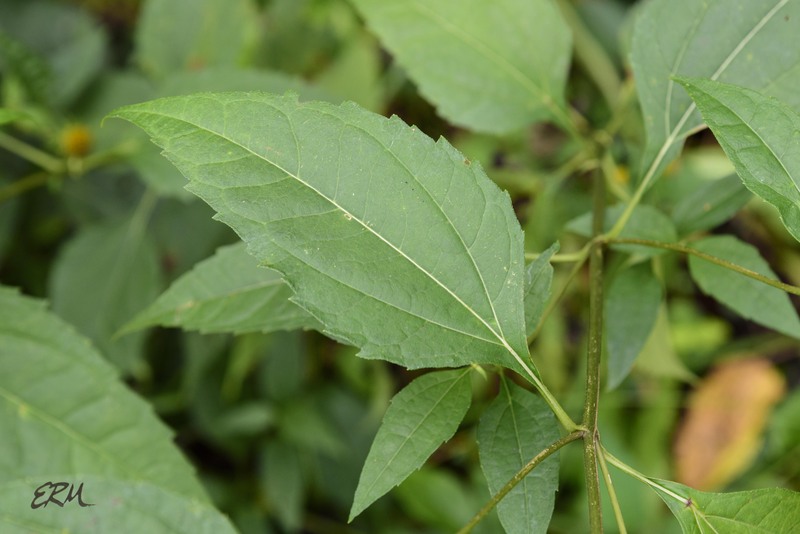 First there was Ionactis linariifolia, then the Solidago species, and now this. I’ve been visiting this same spot near Carderock for five years now. 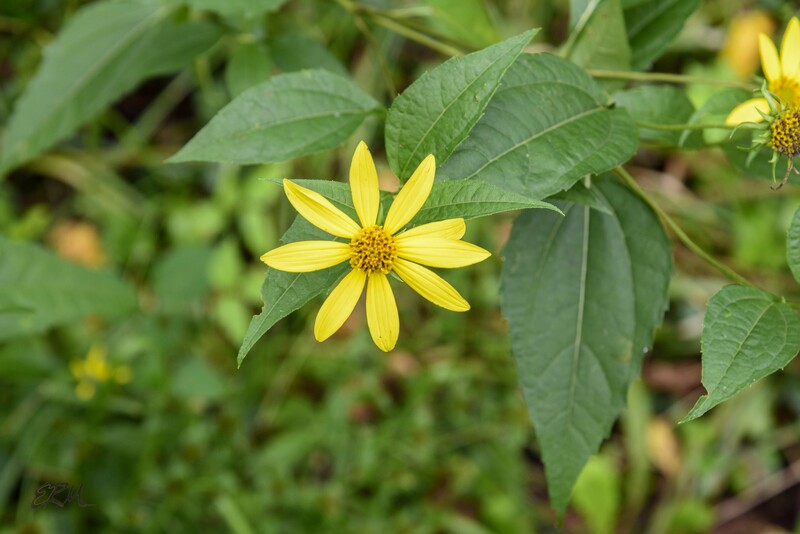 The earliest I’ve ever seen woodland sunflower (Helianthus divaricatus) blooming was late July. 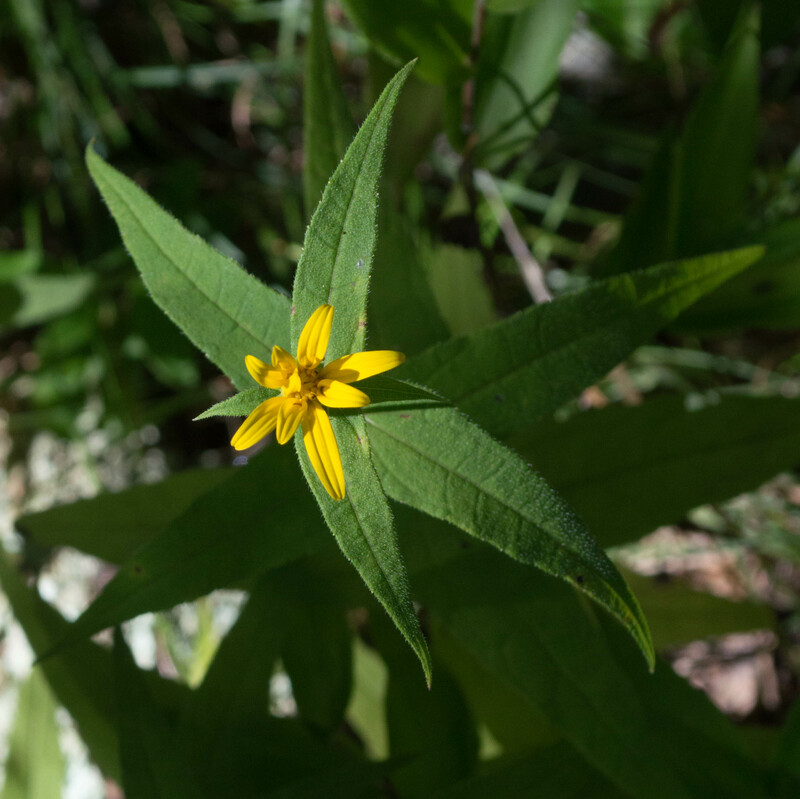 Of the seven or so Helianthus species found in the Maryland piedmont, this is the only one with sessile, entire, opposite leaves, making identification pretty easy. 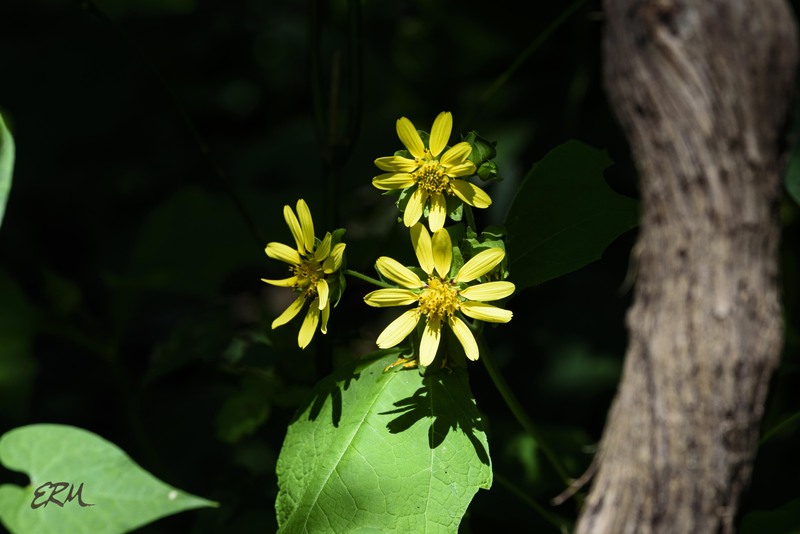 These two species have very similar looking inflorescences, with yellow disks and anywhere from 8 to 20 rays; note that despite the specific epithet “decapetalus” (meaning ten petals), thin-leaved sunflower does not always have ten rays. Both grow from two to six feet tall. Despite this and the similar flowers, it’s easy to tell them apart if you look at some of the details. 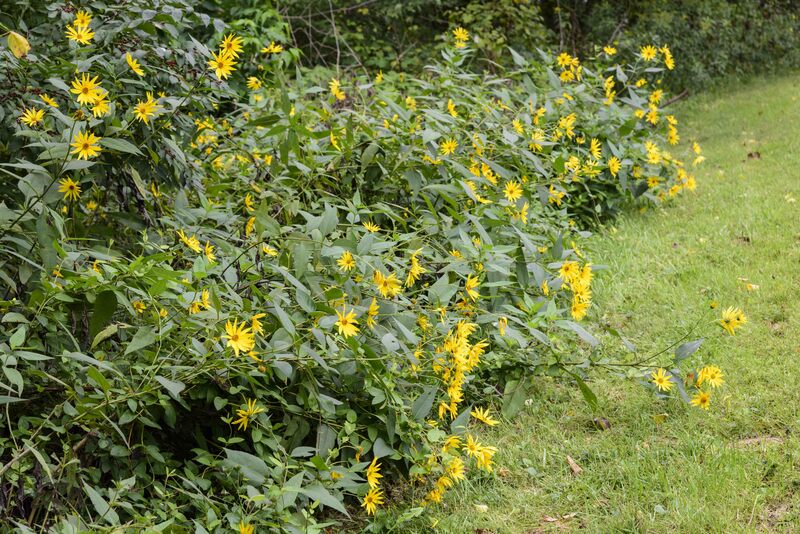 Habitat: woodland sunflower, as the name suggests, tends to be found in the shade of woodlands, often in drier soils than the other species. 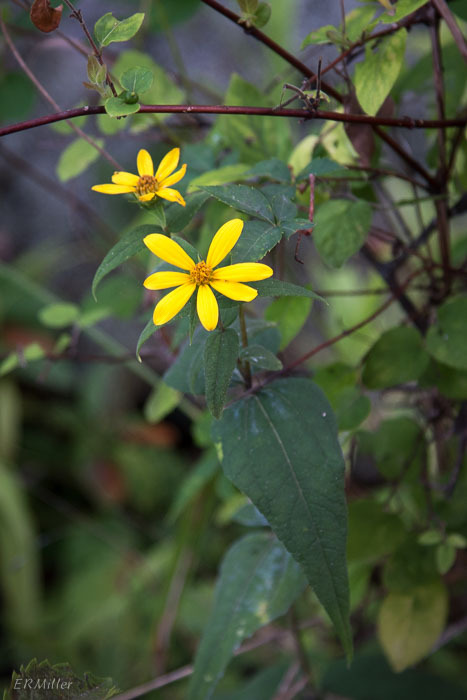 Thin-leaved sunflower is more often found in open areas between trails and the river, where there’s more sun and moisture. 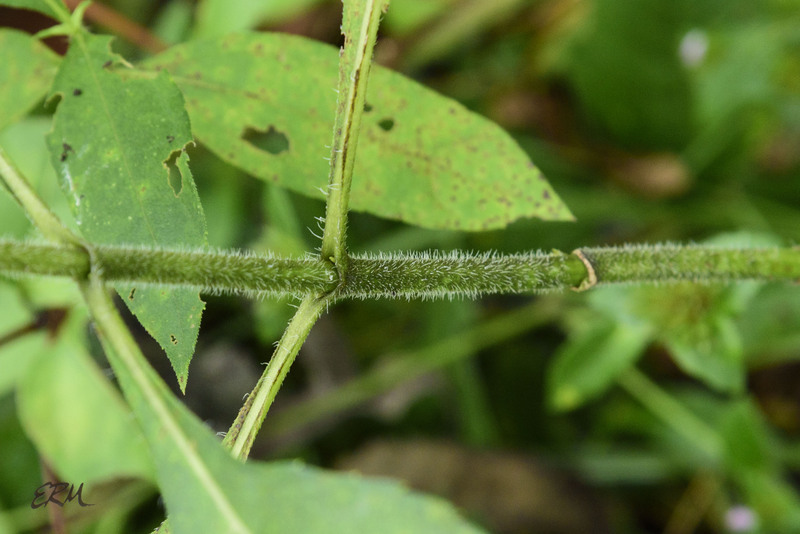 Woodland sunflower has long-tapering, lance-shaped leaves that are either sessile or with very short petioles. The margins have a few slight teeth. 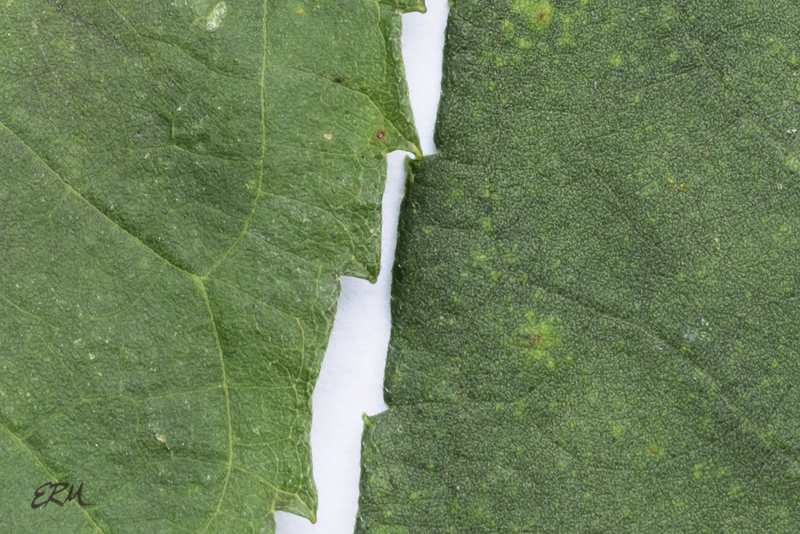 The leaf surface is rough to the touch, like sandpaper. 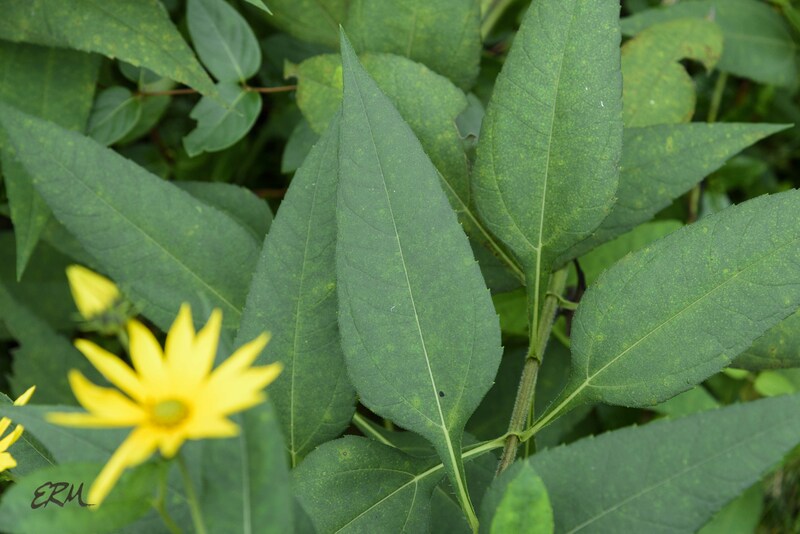 The leaves of thin-leaved sunflower have long petioles, often winged (especially the larger leaves, which are sharply toothed), and the top leaf surface is smooth. 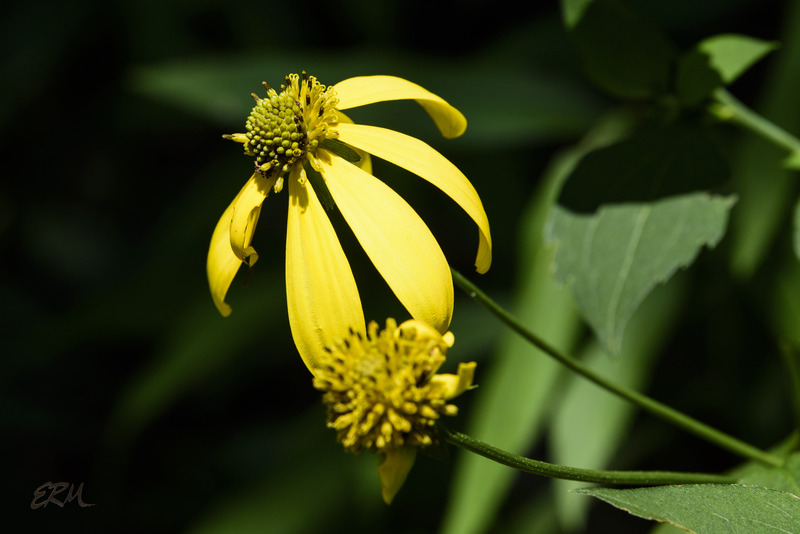 Woodland sunflower can be found in the eastern US and a few states west of the Mississippi. In the Potomac Gorge, it’s not too common. It’s listed as “special concern” in Rhode Island. 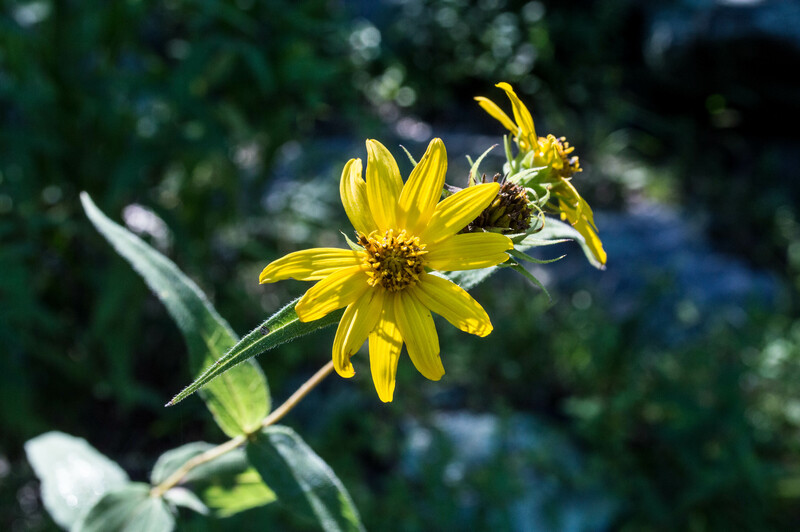 Thin-leaved sunflower has a similar range and is much easier to find in the Gorge, especially along the eastern half of Billy Goat C. There are no conservation issues. 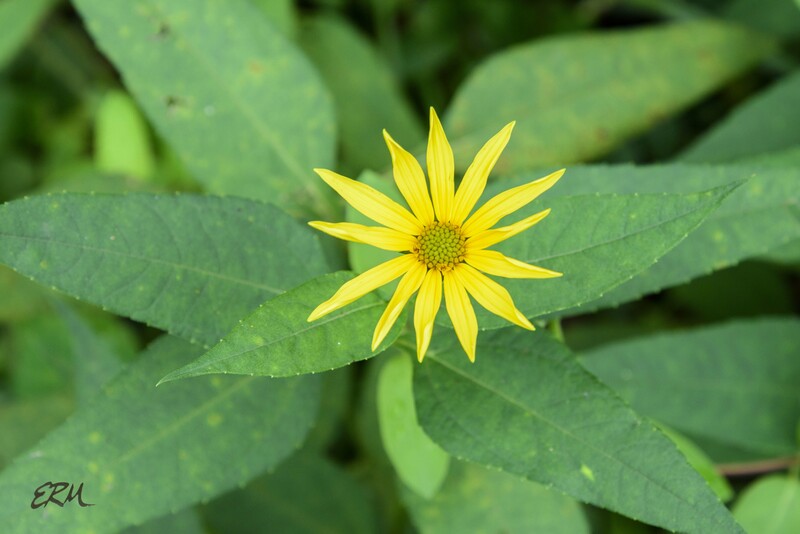 Sixty more native species and naturally occurring hybrids of Helianthus are in the continental US and Canada. Seventeen total can be found in Maryland; of these, three are listed as S1 (“highly state rare”) by the DNR. 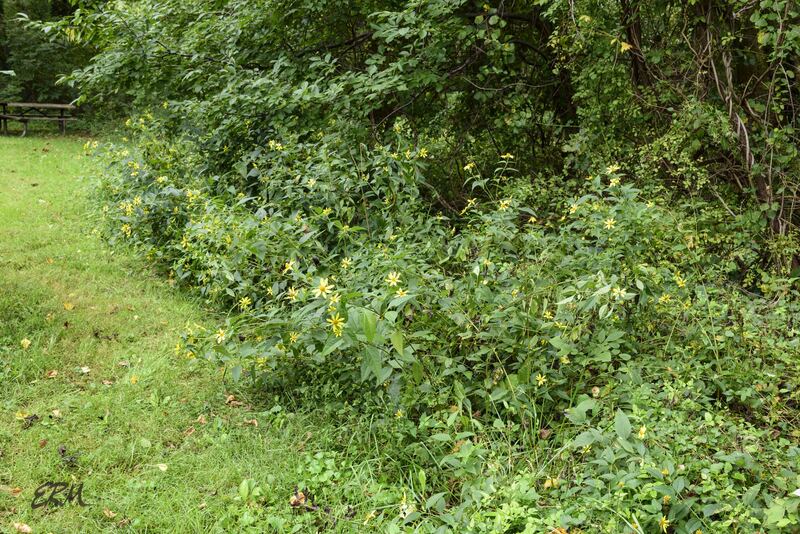 In August the Potomac downstream of Carderock is lined with tall flowering plants by the thousands. 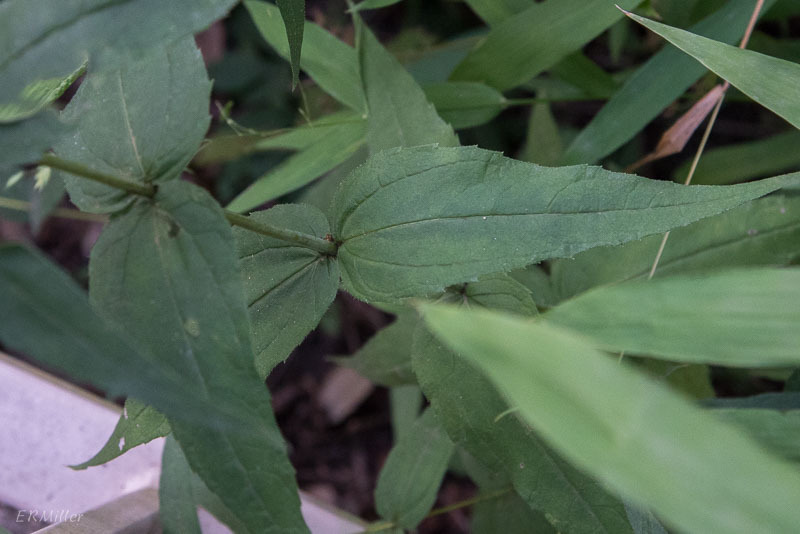 Halberd-leaved rose mallow (fotd 8/7) is still going strong, though starting to wane, while thin-leaf sunflower (fotd 8/19), tall coneflower, and large-flowered leafcup (come back tomorrow to read about that one) are dominating the view. And I do mean dominating, as these plants can grow to eight feet in height, and tend to form large colonies through rooting. Flowers in the aster family (formerly known as the composite family, Compositae) are fascinating. 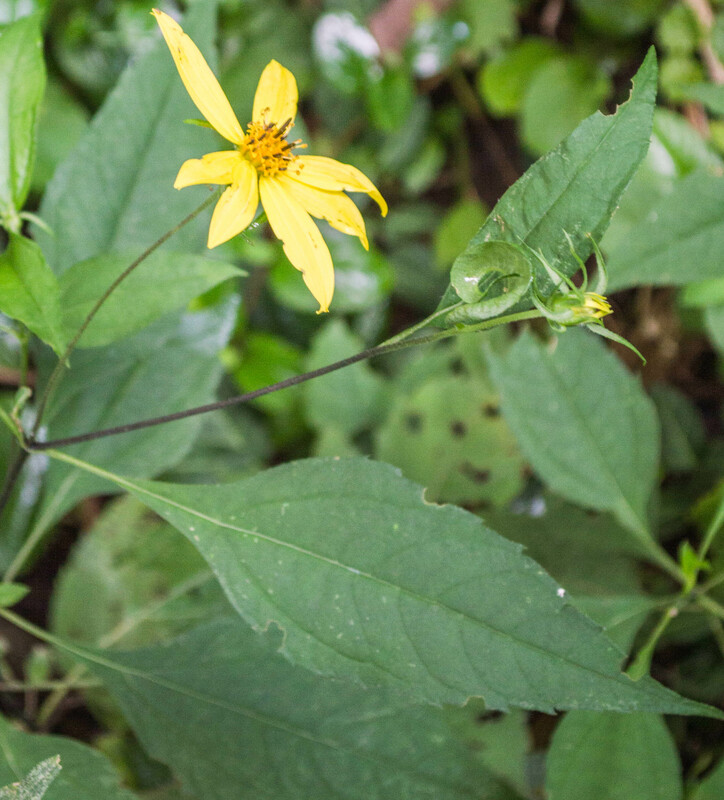 What appear to be petals are actually individual flowers, known as rays; the central portion of the head is comprised of individual disc flowers. In some composite family flowers, like the Eupatorium species I wrote about last week, only disc flowers are present. 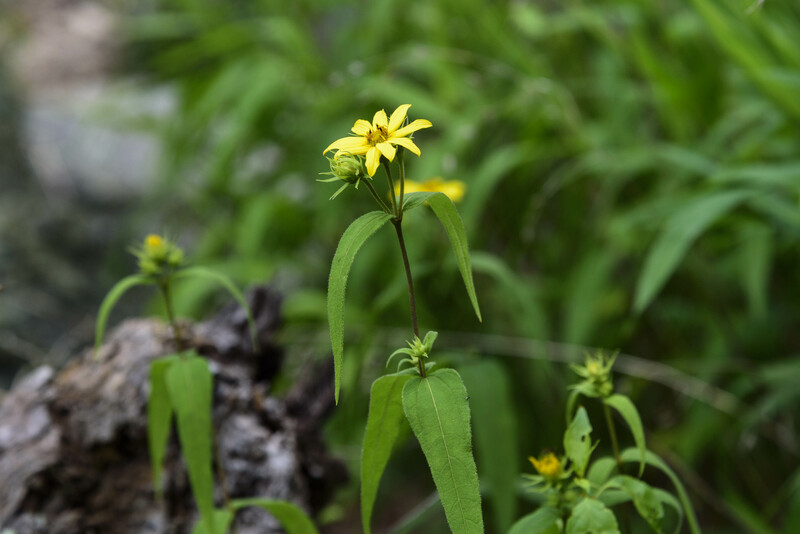 In others, like rattlesnake weed (fotd 5/31) and hairy hawkweed (come back the day after tomorrow), there are only ray flowers. The coneflowers (Rudbeckia and Echinacea species) are easily distinguished from the sunflowers (Helianthus species, and many others) by the reflexed ray flowers and the more-or-less spherical shape of the disc. 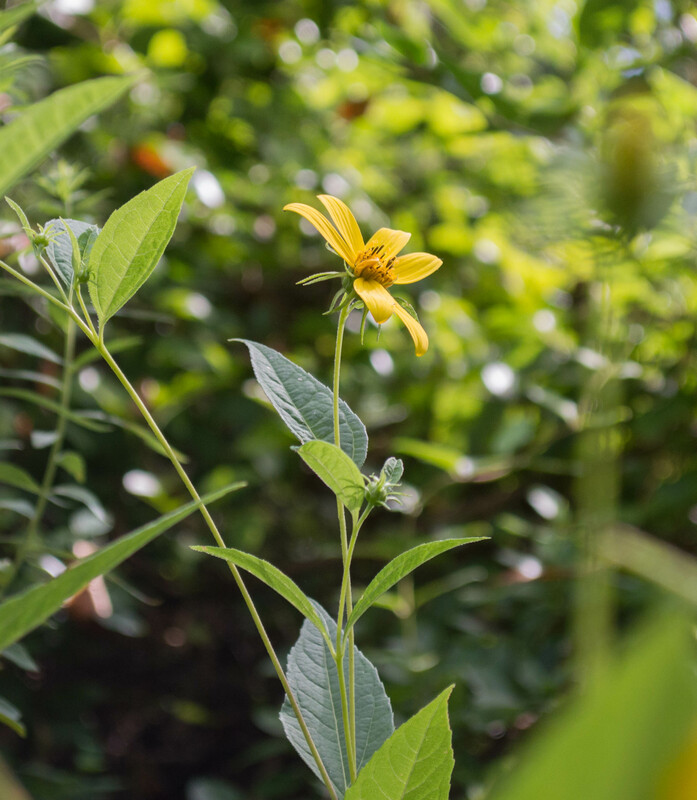 There are 22 species of Rudbeckia in the US, four of which are found in this area, including Maryland’s state flower, the black-eyed Susan (R. hirta). Tall coneflower is threatened in Rhode Island. 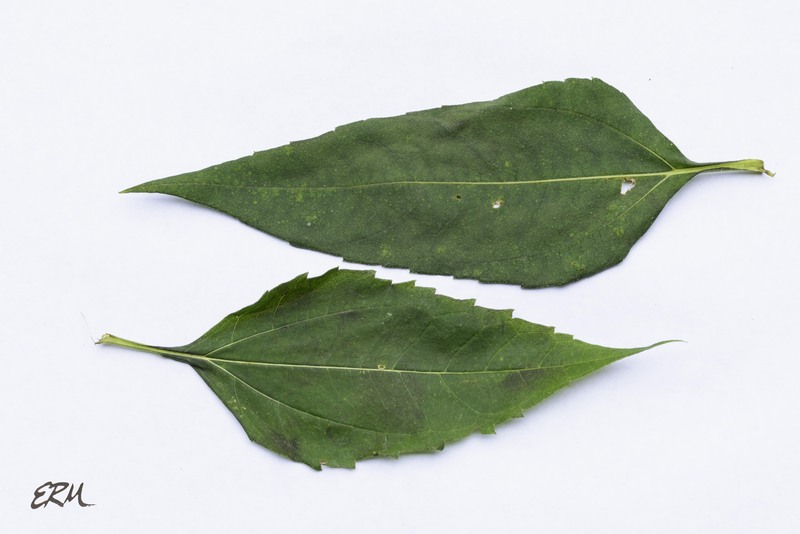 Both of these woodland species share a similar range across the eastern US. 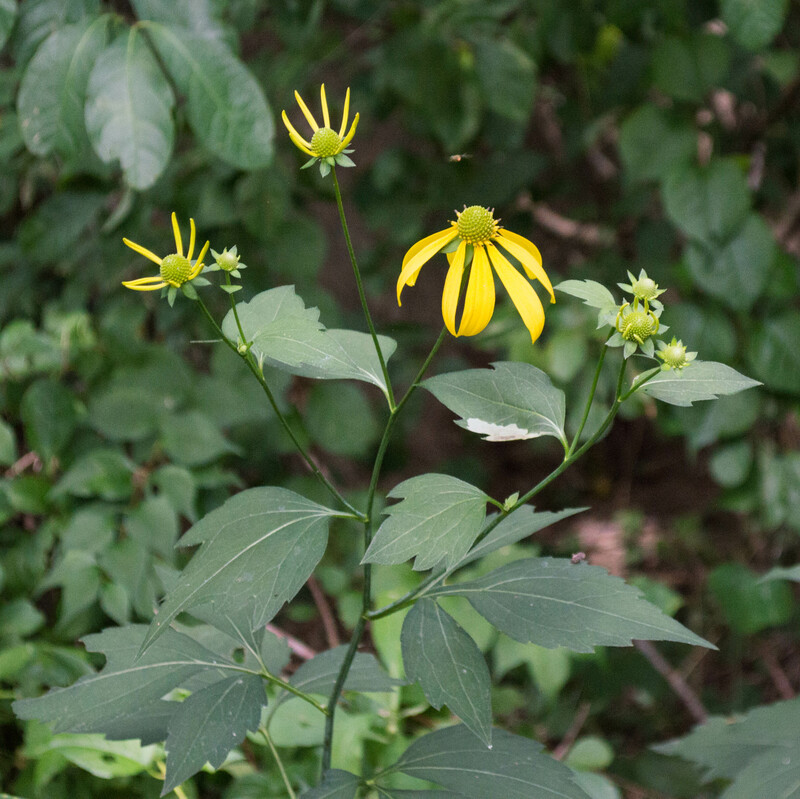 The woodland sunflower likes conditions a little shadier and a little drier, while thin-leaved sunflower likes a bit more sun and moisture. 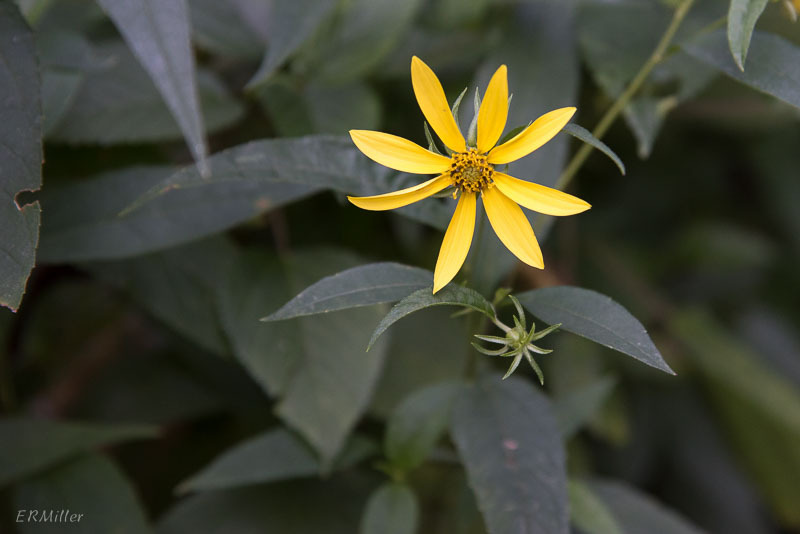 Woodland sunflower will grow three to six feet tall, with flowers one and a half to three inches across. 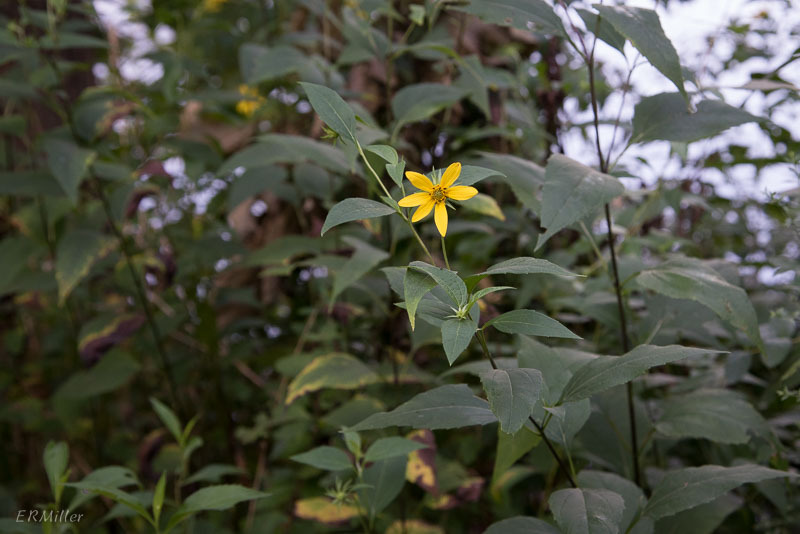 Thin-leaved sunflower will grow to five feet tall and can have slightly larger flowers (two to three and a half inches across). The most obvious differences between the two lie in the leaves. 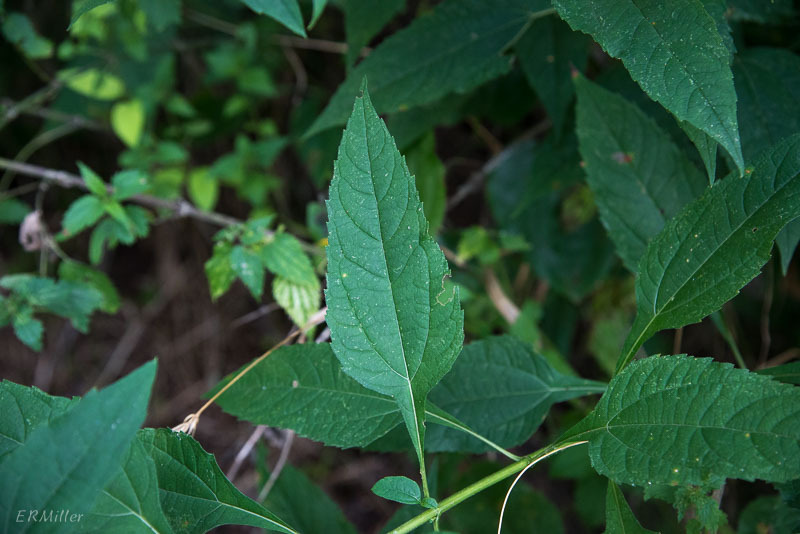 Woodland sunflower leaves are blunt at the base, sessile (the leaf base touches the stem of the plant), and are exceptionally long-pointed at the tip. 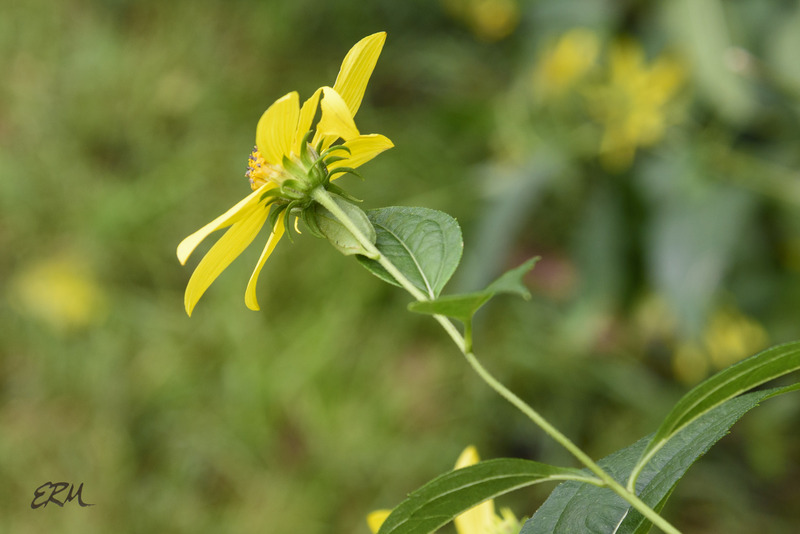 Thin-leaved sunflower has a slightly long-tipped leaf that narrows dramatically into long, winged petioles.